Congressmen Scott Tipton and David B. McKinley discuss visiting Judea and Samaria, their meeting with Netanyahu and U.S.-Israel relations. 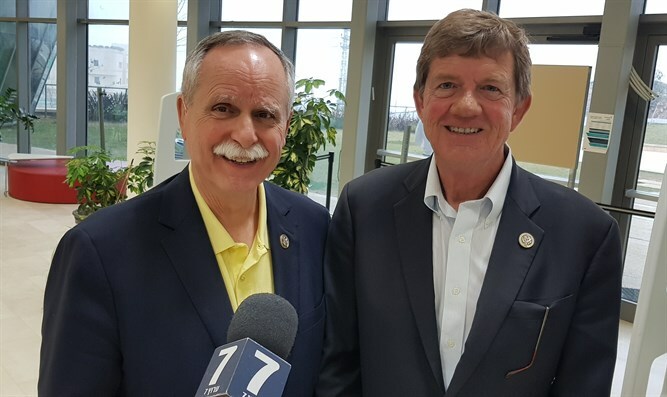 Arutz Sheva met Congressman Scott Tipton and Congressman David B. McKinley at the Ariel University, as they are concluding the fact finding mission to Israel sponsored by Proclaiming Justice to the Nations and facilitated on the ground by Jaffe Strategies. During their visit to Israel the congressmen met the sovereignty campaign and understood the demands of the campaign for Israeli control in Judea and Samaria. After days of hearing the nationalist opinions and identifying with the message of the sovereignty campaign, the congressmen approached Prime Minister Binyamin Netanyahu with a direct question on the issue. The congressmen said that Netanyahu replied by saying that Israel will always be in charge of security from the Mediterranean to the Jordan. Netanyahu also told the congressmen that the Iran deal was bad and should never have been signed, stressing three concerns: Iran’s ballistic missile program, inspections and the sunset clause in the agreement. “We see this as an up and coming university, one that is trying to do more research and we want to see more partnerships with America,” he added. The two Congressmen said they are excited about the United States embassy moving to Jerusalem.